It might have been the first and only time fans at Nationals Park in Southeast D.C. chanted about a trade measure and a president (who was not one of the running mascots) gave them a thumbs up. President Barack Obama’s surprise appearance at the 54th Annual Roll Call Congressional Baseball Game Thursday night shocked and excited fans, as well as the Democratic and Republican members of Congress who were playing in the yearly partisan face off. Democrats ultimately scored their seventh victory in a row, besting their GOP opponents 5-2. For some Democrats, even the unanticipated arrival of the head of their party didn’t take their focus off the game. “Listen, I love the president. And I’m always happy when he comes. But it was kind of like a circus for a while with him out here,” the Democrats’ manager, Rep. Mike Doyle of Pennsylvania, told Roll Call with a laugh after the game. Doyle noted that the game was much tighter than in recent years , and pointed to the curve balls coming from GOP freshman Rep. Mark Walker, R-N.C. Walker pitched until the bottom of the sixth inning, battling Democratic ace pitcher Cedric L. Richmond, D-La. Walker was awarded his team&apos;s Most Valuable Player award at the charity game&apos;s after-party. GOP manager Rep. Joe L. Barton of Texas said Walker did a great job pitching, as did veteran Illinois Rep. John Shimkus, who came in as a reliever. But he acknowledged the loss was partly self-inflicted by fielding errors. Republicans had a rough start, making a series of errors in the bottom of the first inning that gave Democrats their first two runs. But the GOP battled back in the top of the second, scoring a run. The score remained at 2-1 until the bottom of the fifth inning, when Democrats scored again, and they proceeded to score two more in the bottom of the sixth. Rep. Linda T. Sánchez, D-Calif., the only female player , stepped up to the plate in the bottom of the sixth, eliciting a roar from the crowd that rivaled the cheers for Obama. Sánchez delivered, firing a shot down the first base line and advancing the runner to third. Republicans had a brief moment of hope in their last at-bat at the top of the seventh, when freshman Rep. Ryan A. Costello, R-Pa., hit the ball deep into center field to bring in a run. But the momentum ultimately did not shift in the GOP’s favor. The game ended with a high fly ball to second base, landing in the glove of Rep. Raul Ruiz, D-Calif., the 2014 Democratic MVP. Ruiz was spotted video-chatting with his wife and one of his twin daughters after the game, who congratulated him on the win. Democrats named three MVPs Thursday: Indiana&apos;s Joe Donnelly, one of just four senators who played in the game this year, Richmond and Sánchez. Although the players appreciate that the game allows them to interact with their colleagues outside the Capitol, they couldn’t escape the business of Congress Thursday night. An hour before players took to the field to warm up, House members faced a nail-biting procedural vote to pave the way for a Friday floor vote on two trade measures. And even a baseball game in the stifling D.C. humidity couldn’t quell thoughts of the impending trade vote. “T-P-A! T-P-A!,” fans on the Republican side of the ballpark shouted as Obama made his way around the field in the fourth inning, referring to the trade measure that aligned the White House and GOP leadership. Obama smiled, turned around, and gave the fans a thumbs up. 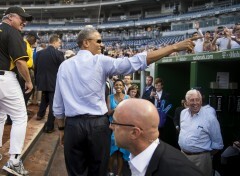 Though most fans didn’t realize Obama was in the Democratic dugout until the fourth inning, Democratic players noticed him in the bottom of the third, while Richmond was at the plate. Richmond’s shoulder was wrapped in ice following his seven-inning stint on the pitcher’s mound since he is still recovering from a November shoulder surgery . He said he was in pain, but hoped to be back “100 percent” next year. Republicans acknowledged they will have to step up their defensive game next year, but seemed optimistic the contest was much closer than last year’s 15-6 defeat . 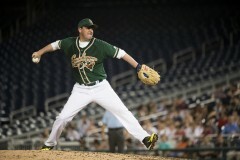 Obama Makes Surprise Appearance at Congressional Baseball Game, Democrats Win 5-2 Full Coverage of the Roll Call Congressional Baseball Game Democrats&apos; Ace by Night, Pivotal Trade Vote by Day See photos, follies, HOH Hits and Misses and more at Roll Call&apos;s new video site. Get breaking news alerts and more from Roll Call in your inbox or on your iPhone.